The new Thermage generation offers a perfect curve! The latest method of reducing sagging with RF radio technology, without surgery! 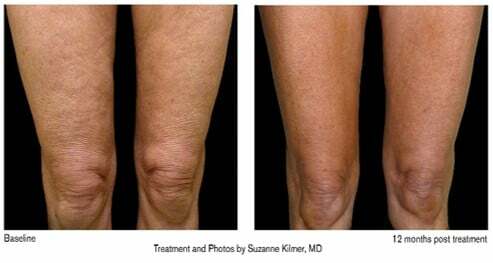 Thermage is a high-frequency therapy device that improves sagging and skin wrinkling with radio frequency (RF). The temperature of the electromagnetic wave makes Collagen in the dermis shrink, the skin becomes firm, giving the face a perfect contour. 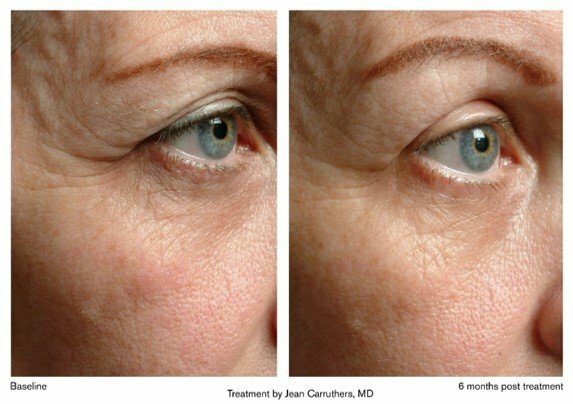 It is the latest treatment for people who want to treat wrinkles and sagging without using surgery. High temperatures will damage the dermis cells, thereby activating large amounts of collagen during treatment. Therefore, it is possible to expect skin rejuvenation and skin beauty effects. 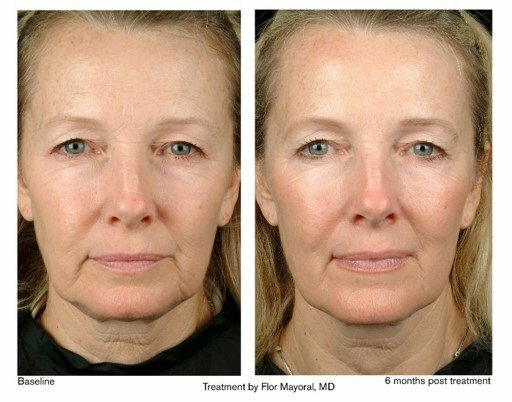 Thermage was researched and developed by Thermage (USA) in the United States as “Radio frequency / wrinkle removal (RF) medical treatment equipment”. 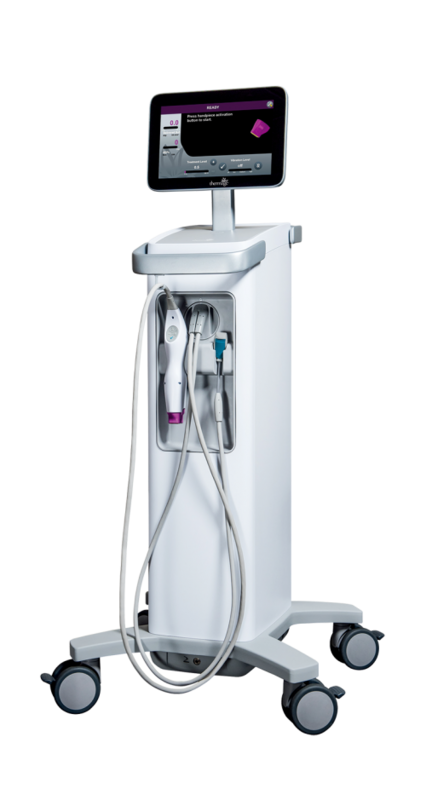 Ever since the first generation “Thermage CT” was announced in 2002, it has received a lot of attention from societies and media as “an engine to reverse aging”. . 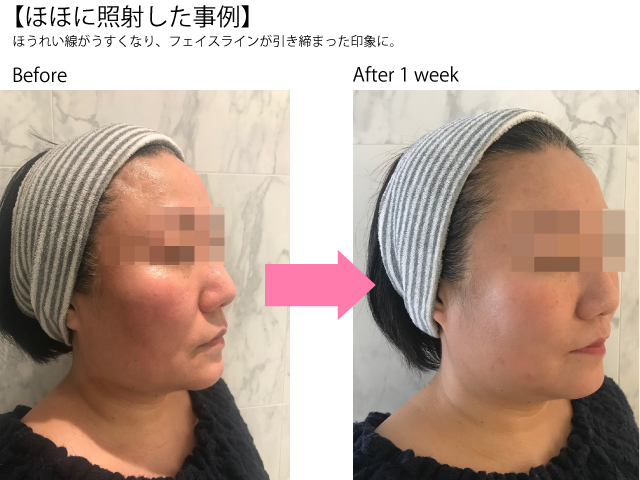 Since then, Thermage has been praised by many beauty care websites as “surgery free face lift”, and is now rated as “the treatment for sagging and aging skin” with more than 1 million treatment cases in more than 80 countries worldwide. Since the launch of the “Thermage CT”, it has been suggested that the high therapeutic effect is also associated with the pain of treatment, but the second-generation “Thermage NXT” improved the projection method in 2007, and in 2009 the 3rd generation “Thermage CPT” appeared to have greatly improved its effectiveness as well as minimized pain during treatment, since then it has been more accepted by many patients. It has been 8 years since “Thermage CPT” appeared. The fourth generation “Thermage FLX” is a breakthrough that appeared in 2018. Compared with the previous model, the amount of heat increased 1.3 times, the depth increased by 180%, you can feel the high firming effect immediately after treatment, upgrade the cooling system and vibration function to reduce pain. and more comfortable to treat. In addition, the treatment locus is also larger than conventional machines (3.0 cm² → 4.0 cm²) and the treatment time is shortened by 25%. In addition, the device also shows its effects on the eyes and body, wider range of treatments and can solve all aesthetic problems of the body. We have introduced the most advanced line of “Thermage FLX” at our institute, providing “less painful, safer, shorter treatment time” therapy for patients. The effect of Thermage FLX――Instantly feel effective without down time! Effective skin / firming skin lasts more than half a year! 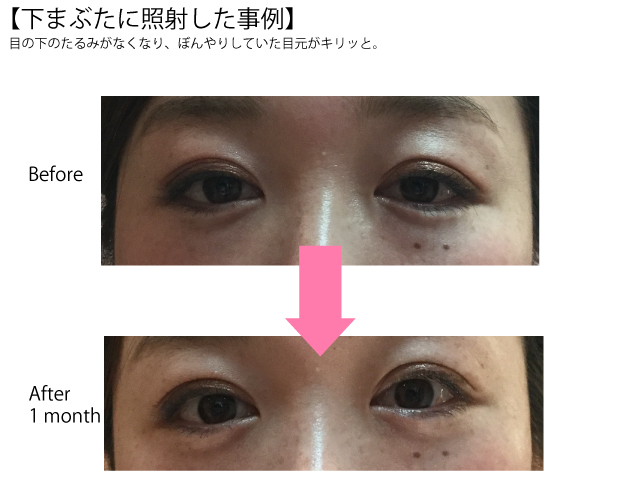 Thermage can be effective for firming and improving the lines effectively thanks to two reactions. Not only does it affect sagging skin, but it also beautifies skin effectively, which is the outstanding feature of Thermage. Collagen fibers in the dermis layer will be immediately firmed by the heat of RF energy. It is also possible to expect the improvement of facial contours by affecting the subcutaneous fat layer. During the recovery of collapsed collagen fibers, new collagen is formed and replaces the contracted collagen fibers. This wound healing effect lasts about 6 months. Collagen fibers in the dermis shrink due to the use of heat. Therefore, by high-frequency irradiation of Thermacool, three-dimensional tightening is possible in length, width and depth, and has an immediate effect on stretching the skin. In addition, because the fiber septum in the subcutaneous fat also shrinks, the contour of the face stretches up, giving a firmer face. Moreover, not only the skin but also the subcutaneous tissue also has collagen denaturation when it comes to hot heat, sebum shrinks and pores are opened, effective for acne and oily skin. The dermis cells are damaged by high-frequency heat and activate large amounts of collagen during repair, so you can feel the best skin effect in about a month after treatment. In addition, this self-healing ability (wound effect) lasts more than half a year. Treatment handpiece have been changed from 3.0 cm² to 4.0 cm² compared to conventional machines, the irradiation area has increased, so the treatment time is reduced by 25%. Thermage FLX has a “fine tuning function” that can measure the exact amount of energy for each shot, it is safer because the irradiated surface is heated evenly by using the appropriate energy. In addition, intermittent cooling (prior to irradiation, during irradiation, after irradiation) is performed by injecting cool air from the inside of the treatment handpiece to prevent thermal damage on the skin surface. At the same time reduce the feeling of pain transmitted to nerves. Because of the continuous heat energy projection, the pain in each point also decreased. Thermacool applied “gate control theory”, a feeling of vibration infused into the brain faster than pain and helped reduce pain at the time of treatment. In conventional machines that only vibrate vertically but “Therma FLX” vibrates in many directions, so the pain feels less and less noticeable. 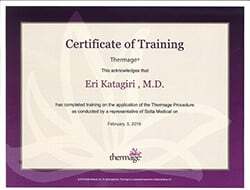 Dr. Eri received a certificate from Thermage! Thermage certification is a medical system established by Thermage Inc. of the United States, manufacturer of Thermage. In order to obtain this certificate, it is necessary to join the manufacturer’s curriculum to obtain the correct treatment technology, and the certificate is only issued to doctors who have completed the curriculum.